As soon as the weather clears up for a few days, I plan to get outside and paint the exterior of my house. It’s supposed to rain for the better part of the next two weeks, so I know it’ll at least be the end of this month before I can start, and maybe even next month. But after several of you mentioned that I could do the pressure washing before the rain gets here, I decided this last weekend to get a head start on that. I had intended to just rent a pressure washer, but I found out that that would cost me $80 per day, and I estimated that I’d need it for two days. So I decided rather than spending $160 on a rental, I’d rather just buy one. I didn’t want to spend a lot of money, so after reading reviews, I narrowed it down to this $99 1600-PSI Greenworks pressure washer from Lowe’s, which had 96 customer reviews and an average 4.1 customer rating, this $159 1700-PSI Ryobi pressure washer from Home Depot, which had 924 customer reviews and an average 4.4 customer rating, and this $199 2000-PSI Ryobi pressure washer from Home Depot, which had 123 customer reviews and an average 4.3 customer rating. …and seeing it completely change right before your eyes. Side note…that window on the right is in my office, and you’ll notice it still has a window unit air conditioner. It’s not there because I need it. It’s there because I’m not so sure that that window will actually close if I remove the air conditioner. When I tried to remove the one in the dining room (after we got our HVAC system, and before we got our new windows), I couldn’t get the window to budge at all. So I’ve been hesitant to remove that A/C, and right now I plan to just leave it there until we get new windows for that room. Anyway, I had so much fun with my new pressure washer. 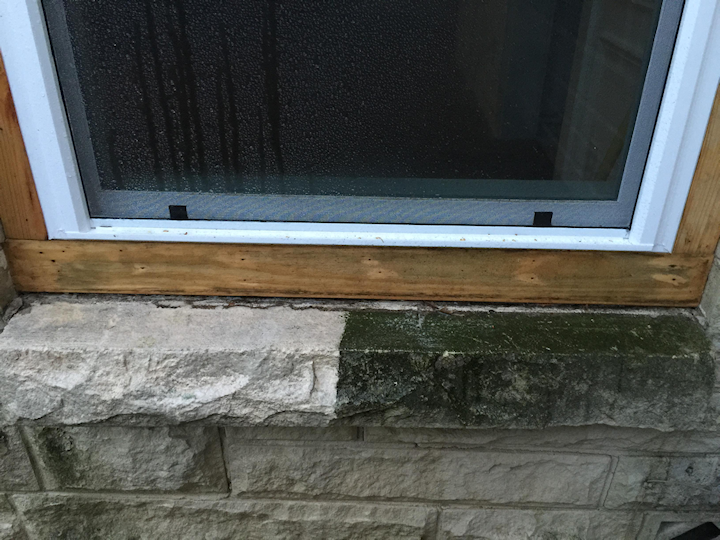 Check out the amazing job it did on this window sill. And the pressure washer cleaned them right up, and made them look like new cedar posts. 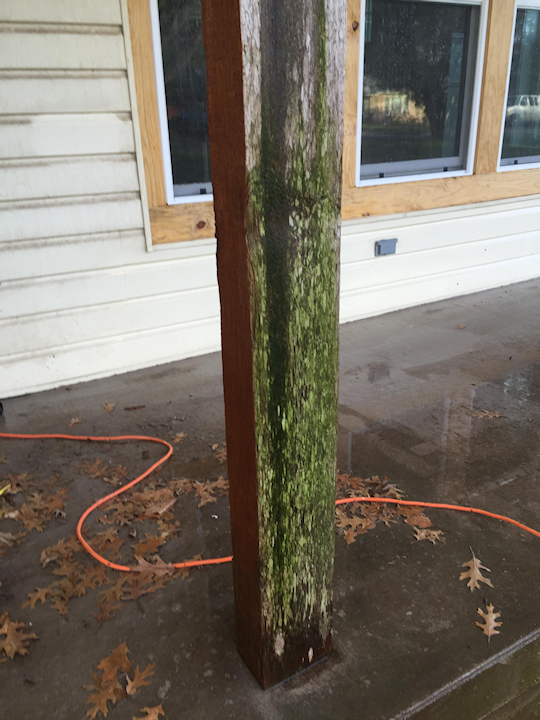 You can also see in the photos above how filthy the vinyl siding was (to the left of the post), and it did a fantastic job of getting it clean as well, as you can see to the right of the post. I didn’t quite get finished with all of the pressure washing before it got too dark to work, so I’ll have to finish that up before I can get started painting. But I did manage to get some updated exterior photos before the sun went down. There’s nothing terribly exciting to show right now, but I did want to get some good “before” pictures before I really get started on any major projects since the photos I have are over two years old. So here’s how my house looks right now…cleaner than it was, but still in desperate need of some updates. We have a really large side yard on the left of the house that will need lots of attention when it comes time to landscape. Several of you suggested that I paint the stone on the house a different color than the siding (e.g., white stone and yellow siding). But you can see in these photos why I don’t think that would work. The entire left side of the house is stone, as is the left half of the front of the house. The vinyl siding is on the front porch, on the front of the breakfast room, and on the garage. And then the side area between the front porch and the breakfast room is siding on top and stone on the bottom. You can see where I left off on my pressure washing. The vinyl siding above the stone on that part has mildew that needs to be washed off. The ways in which the stone and siding were combined on the exterior of this house just seem so discombobulated to me, and I can’t imagine highlighting that strange combination with two different paint colors. I’d rather the differences be blended away as much as possible with one solid paint color on everything. And I eventually want the stone removed completely. I want the exterior finishes to be much more balanced when it’s all said and done. I also want that leaning pecan tree removed. I hate cutting down trees, but thank goodness I have a good excuse to cut that one down. When we had our trees trimmed a couple of years ago, the owner of the company told me that that pecan tree probably wouldn’t last much longer because the main trunk is dying from the top down. Last spring I noticed that when the leaves all came back, the top five feet or so of the main trunk was completely dead, and it hasn’t produced a single pecan in the two years we’ve been here. Anyway, that’s my house as it currently looks in its “before” state. I have a vision for it, and for how I want it to look when it’s all finished. It will eventually undergo a major facelift, but that will have to wait until we have the house paid off (hopefully at the end of next year) and can save up for the remodel. One aspect of your blog that I absolutely love is your excellent grammar and spelling! It’s so nice not to be distracted by the errors so prevalent among other blogs! My sister has vinyl siding and has it washed every year because it gets so dirty. That power washing did a major job and it all looks so nice (except that patch that needs to be power washed). Oh I’m sorry to hear you want to get rid of the stone. 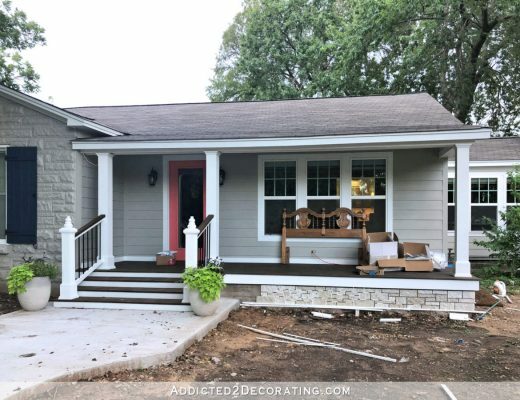 I love Austin stone (or limestone) but I do agree your configuration of stone and siding is unusual and I can see why you want it all one color. The cedar posts sure cleaned up nicely. I agree. I love the stone. On the other hand I truly dislike vinyl siding, but if I remember correctly, you have plans for that in the future. I’m having a little giggle here. All of us that follow you know exactly what is going on with the exterior of your house. People who drive by however… lol especially with the amazing mail box out there. For the record, during my bathroom remodel we had a toilet in front of our house for three days. Cant wait! As I’ve mentioned before, we have a light gray (and probably very cheap) vinyl siding that seems to have lost its glossy finish. It always looks dirty and one side of the house has a green moldy layer on it. I’ve tried power washing it, but the mold just doesn’t want to come out of the faux wood grain. I’ve tried bleach, various vinyl siding cleaners, and even elbow grease (via a stiff brush on a pole) and nothing seems to get all of the mold out of it. I’m tempted to take a chunk of the siding down and look at the condition of the shingles underneath, but even if I did, I don’t think I have the stamina to paint a two-story house myself and it’s not very high on the list to spend money on. It’ll have to stay put for now. I’m right there with you on wanting to rip off siding! I can’t even express to you how much self-control it has taken for me to leave the siding alone on my front porch. It’s such a small area, and I’m sure (although I’ve never installed siding in my life) it wouldn’t be much trouble at all to install new siding in that small area. But I’ve forced myself to leave it alone…for now. I want to rip it off so badly, though! Isn’t it amazing the difference a pressure washer makes? Your house looks a couple of shades brighter and very nice. I think you will be happy with the entire exterior painted all one color. It will make the door color and window trim pop out nicely. Good plan to freshen up the exterior while you save $$$ for the exterior reno. Great job! Really starting to look much better! If you cut down the pecan tree are you going to keep the wood to use on future projects? I’ve so wanted to do this with a couple of Oaks that fell on our property, but the logistics of doing so can get expensive unless you have friends with specialized equipment. A lot of tree companies want the wood to re-sell (for firewood in our area), else your price for taking it down goes up. Also, just milling whole logs into boards isn’t easy (unless you’re doing a cross-cut for a stool or a table). You can’t move them around without heavy equipment and you need either a sawmill or an attachment for your chainsaw that lets you slice boards. Then, you need a planer to get them smooth. We had our house power washed every other year. Hubs used to do it himself, but he’s banned from tall ladders (by me) after one too many falls and injuries! At 65, he’s finally learning he can’t do it all like he used to. Thank heavens! 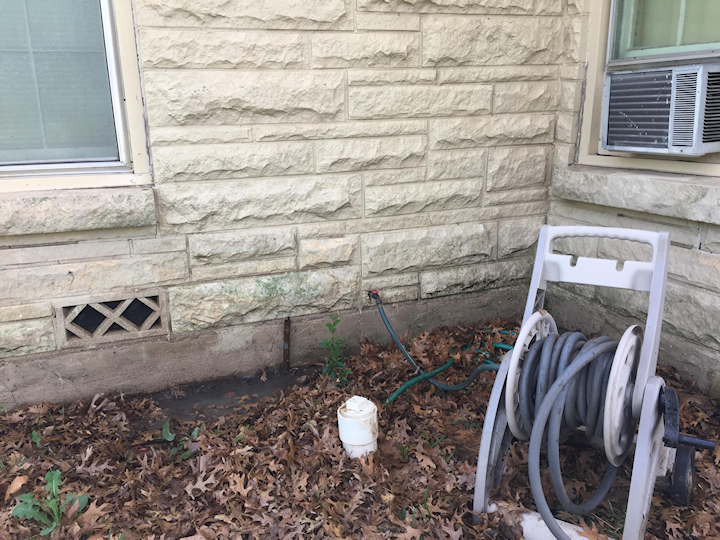 Have you ever talked about removing the Austin stone just on the left side of your home, and leaving it on the office/bumpout? 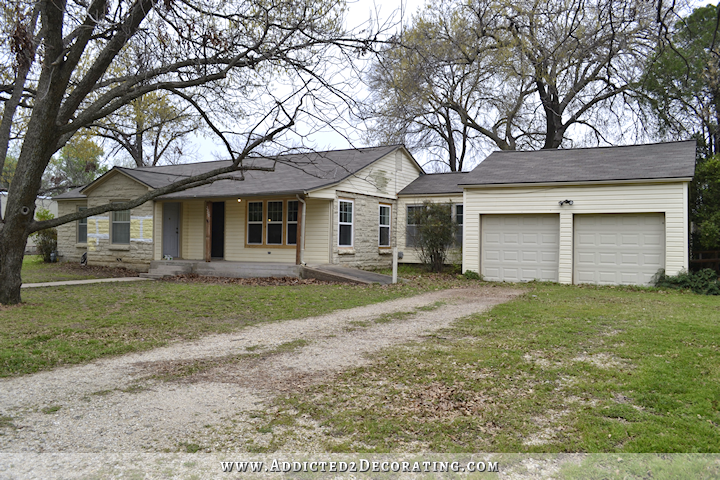 If you had yellow siding on the left, and the Austin stone a different color, it would balance out your home. i agree or maybe adding stone to the garage to balance out the look. Have you looked under the siding on the front of the house? Any chance it is the stone too? The siding and stone were better proportioned on the house originally because the porch columns were also wrapped in stone. I’m not sure when or why the stone was removed, but that happened probably well over a decade ago. I love the idea of painting it all the same color. I really like the new updated pictures, because your house even on the outside has come a long way! I need to do something on my outside of my house as well and I hope to get inspired with you! Once again, you’ve done all the hard work for me!!! We’ve been looking at pressure washers, too! Our porch concrete is turning green here and there and it’s also time to clean up the siding and paint our porch posts (though we’re still good for a few more light snows and one ice storm in WNY). Thanks for the recommendation! BTW, LOVE the yellow (though in my head I briefly toyed with faux painting your austin in mixed hues that coordinated with the yellow, lol)…and your mailbox/post looks great! The pressure washer I got will work great on anything that you can get close to. The closer the nozzle is to the surface you’re washing, the more power it has. Once you get more than about 12 inches from the surface, you lose quite a bit of cleaning power. So it’s probably not the best choice for someone who is wanting to clean the second story of their two-story home. I had to stand on a ladder to get the high places on my house. But for cleaning porches, sidewalks, and decks, it’ll work great! I’m impressed by the impact of the colour on your house seen from so far away – it’ll be really pretty when all of the house is painted in that buttery yellow! I think you are 100 % right in covering both siding and stones in the same colour so as not to accentuate the weird distribution of them on the exterior – and you might then be enticed to ignore the different materials so that in the end you can perhaps postpone the removal of the stone (that must be very labour-intensive?!). All one color definitely. I did a little mock-up. I know you know the details more so than me, but I wanted to get a tiny preview! Wow, love the mock up. Pecan tree needs to come out. Inspiring! I was in no way doubting Kristi’s choice, but that mock up just sold it. Thanks for sharing that with us! That mock-up looks A-MAZ-ING! I personally like the Austen stone and would leave it. Once everything is painted the same color, it will blend right in. But, of course, it’s not my house, lol! I did this for her too on one of her old pictures but yours came out much nicer. My PSP skills are still a bit rudimentary. Angela, that looks great! I’m sure we all have a better idea of how it will look now! Thanks for that! 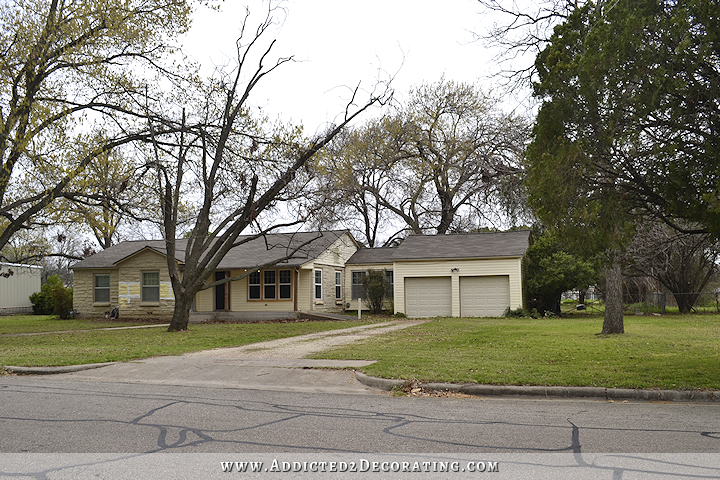 Once you take out the Pecan tree I’m sure that you will see that you don’t need to replace it with another tree. 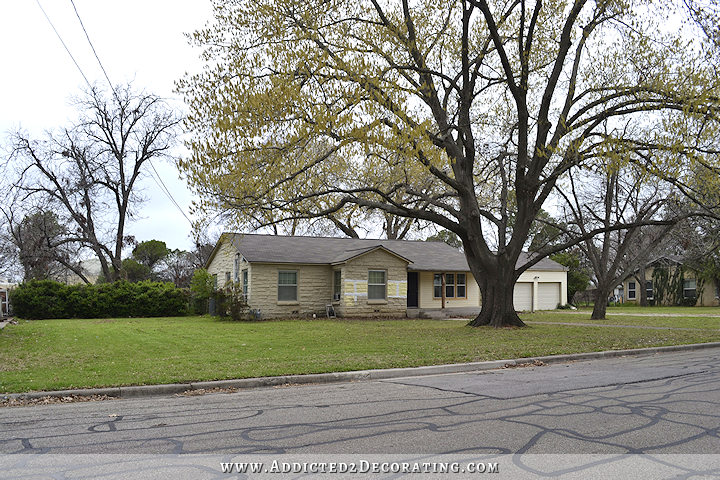 If you look at the pictures you posted you can clearly see that removing that tree opens up the front of your house and brings balance to your front yard. I think once you redo your driveway to it’s original width you will see that re-balances the front of your house as well. Usually taking a wide angle picture of the front of your house gives you the real picture of how your house looks from the street. With that tree removed you have the balance to your front yard that you need. Plus less work and yearly tree trimming costs. Can’t wait to see the finished front. Great job with your pressure washer! I also love using mine………I used it on our patio and front sidewalk last year and it made a huge difference! 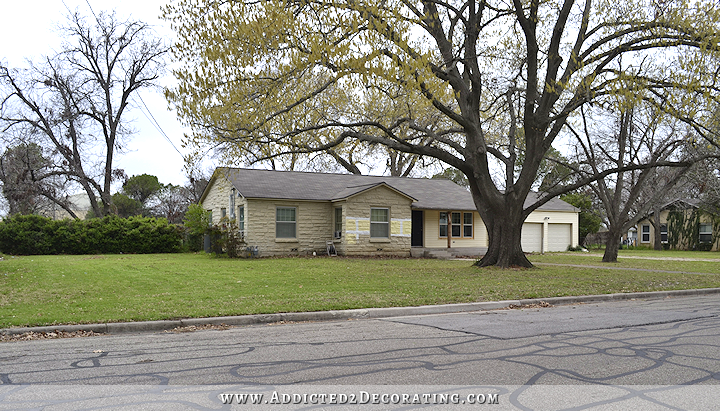 I agree that you should remove the pecan tree and let your oak tree be the “star” of your front yard. I love the banana cream you picked for your house!!! Now, you are going to paint vinyl siding? Does that work well? What about in a couple of years when it needs cleaned (hopefully you will be updated by then, but I’m thinking about houses I work on. It probably can’t be pressure washed (or maybe it can on a lower setting), but yes, vinyl siding can be painted. 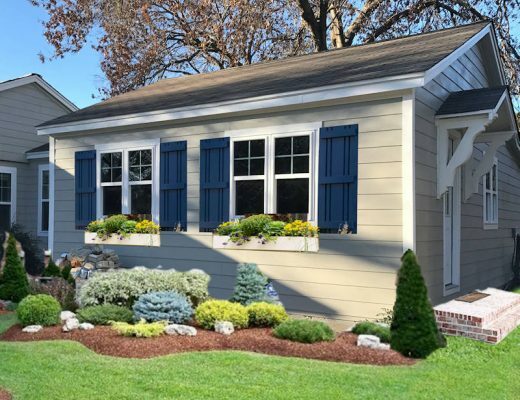 The problem with painting vinyl siding in the past has been that you couldn’t go from a light color to a darker color, because the paint would somehow shrink and buckle the vinyl siding. But now Sherwin Williams has an additive that they can add to their paint that is specifically for use on vinyl siding so that the shrinking and buckling is no longer an issue, and you can use just about any color you want. Thanks for all the research on a washer. I need one and you just saved me a ton of time. I think I’ve said that I’m not much of a yellow person, but your house is going to look fantastic yellow and white. It’s the perfect choice for the house when you step back and look at it from the road. Just keep in mind that this pressure washer is great for surfaces where you can spray really close. If you’re trying to spray the second story of a two-story house while standing on the ground, there won’t be enough power. 🙂 I left a review on the Home Depot site, and gave more info there. Thanks, plan to use it on a patio. Should work great. You just totally inspired me to buy a pressure washer rather than paying to have it done! I hadn’t even considered it before. Thank you! I love pressure washing, immediate gratification at its finest. I am surprised you were not distracted by the neighbors coming over to see what you have up your sleeve. Between the new mailbox and the clean house they know you are up to something (grin) 🙂 Just like everyone else, I am looking forward to seeing the transformation. Now that the vinyl siding is clean, it almost looks yellow in the picture. 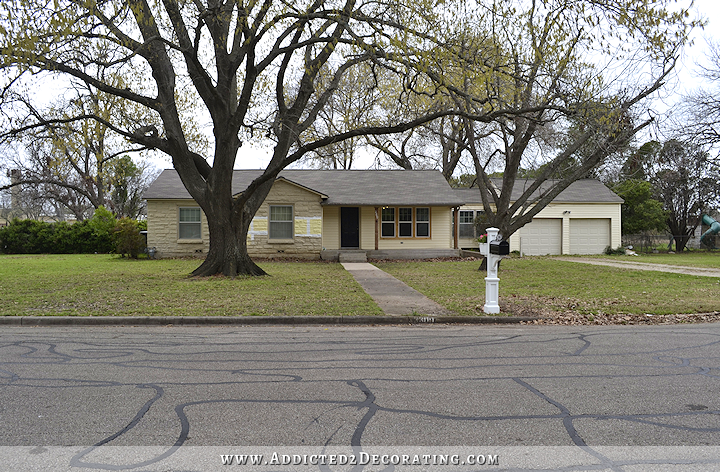 For a quicker temporary fix, why not just paint the Austin stone the same color as the siding, and go with the white trim? Have you checked into pressure washing the siding after you paint it? Wouldn’t that just peel the paint right off? Yep, taking out that leaning tree will open up your front yard and give you a clearer view from the dining room windows as well as a better view to the front door from outside. 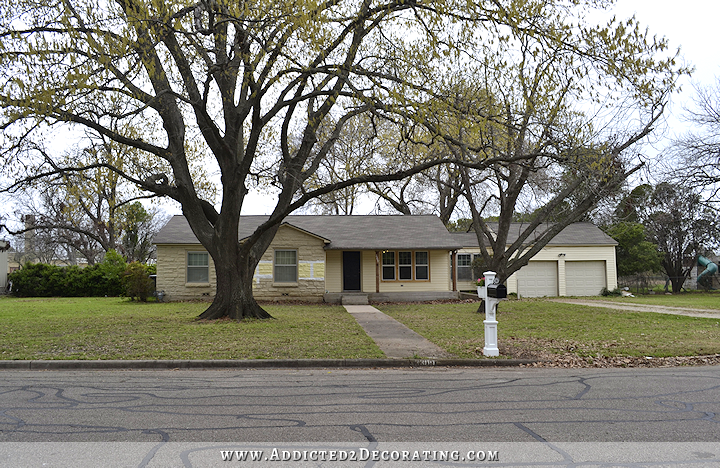 Landscaping will balance the front of the house with the red oak tree. Unfortunately, I don’t like that color at all. It has a touch of yellow in it, but it’s just dull enough to be really ugly, in my opinion. I don’t know if painted siding can be pressure washed on the high setting, but on the lower wash-with-soap setting, I think it’ll be fine, especially if I don’t stand too close while spraying it. Please leave the stone! So much better than vinyl siding! 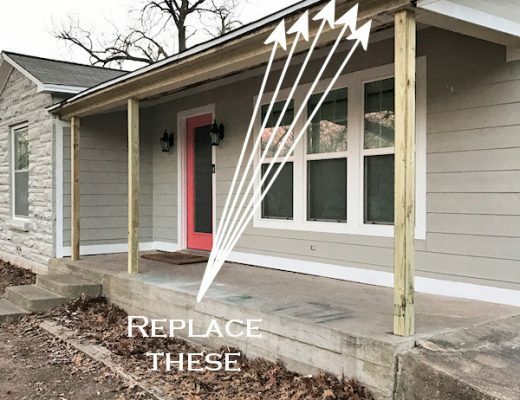 Find an alternative for the siding!! It will be beautiful! The house has potential to be really cute. I definitely agree, that pecan tree has GOT to go! But I think it would be a real shame if you removed the stone. One thought for all you future pressure washers of vinyl (or any other type) siding. Because the water stream is under pressure it can easily get water underneath the siding that can stay there and rot the wood underneath. Be sure to hold the nozzle pointing down from the top so the water runs down the siding and not up inside it. Even holding it straight on can get water underneath. So even with a single story house you can reach from the ground you should get on a ladder and aim down from the top. I think I would consider painting the same color as the vinyl siding. I have not found a paint that will hold up on plastic to the elements, and that’s a lot of painting. Take the time to enjoy this spring and summer being outside doing smaller projects or sitting on the front porch with a glass of lemonade. Save the money for the redo your planning in a few years. Whatever you decide I know we will all enjoy reading and looking at the pictures. Sherwin Williams has a paint (or actually, a paint additive) that’s made specifically for vinyl siding. It should be fine. And I really dislike the color of the siding as it is right now. I would find it difficult to be inspired to spruce up the exterior of my house if I were forced to keep with that color. 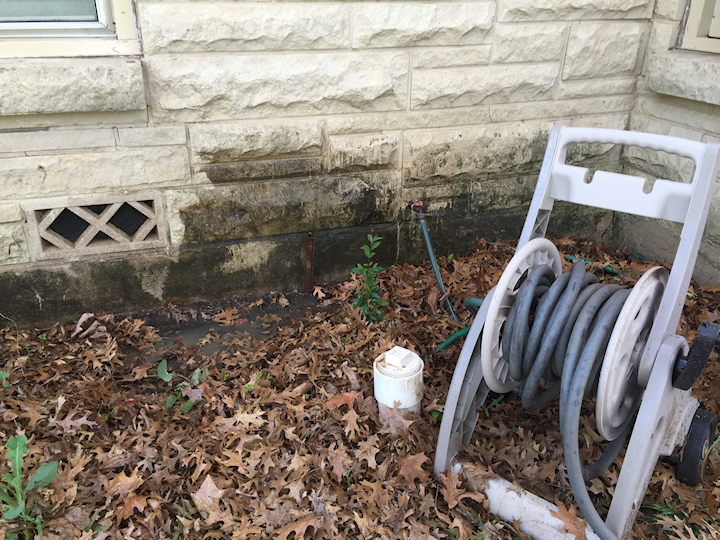 Timely blog – I am looking a pressure washers, too. Do you have to use chemicals with it or did you just use water? 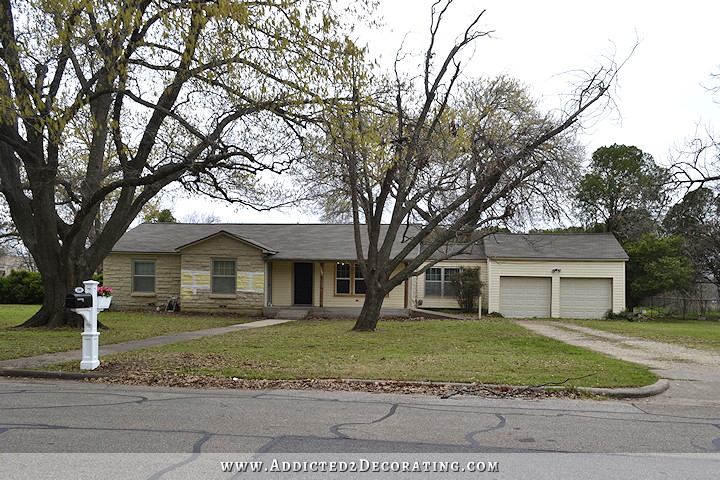 House looks great – can’t wait to see it painted! I just used water, but you can use cleaners with it. You’re not supposed to use bleach with this pressure washer, though. I can damage the machine and void the warranty. The power washing made a HUGE difference! We need to do our 2 story home. Do you think the one you purchased would reach (I’m a novice).? Thanks! And good luck moving forward. I can’t wait to see the total transformation. How about putting the same stone on your front porch. It wouldn’t matter about the color since you plan to paint it anyway. That would tie it together. Even maybe the connecting room to the garage. It is to the point that every day I go thru all my 70+ blog emails just to look to see if you have published one. I am right there with you on painting the entire house the same color. I think you will see a much larger looking house as the result. You truly amaze me. Ps I hope my grammar suited everyone! Ha! Can you wash windows with your power washer? I sprayed mine, but I stood kind of far away. Too close, and I woudl imagine that it could break the glass, especially on my old windows. You can already see a big difference with the power washing. Great work! 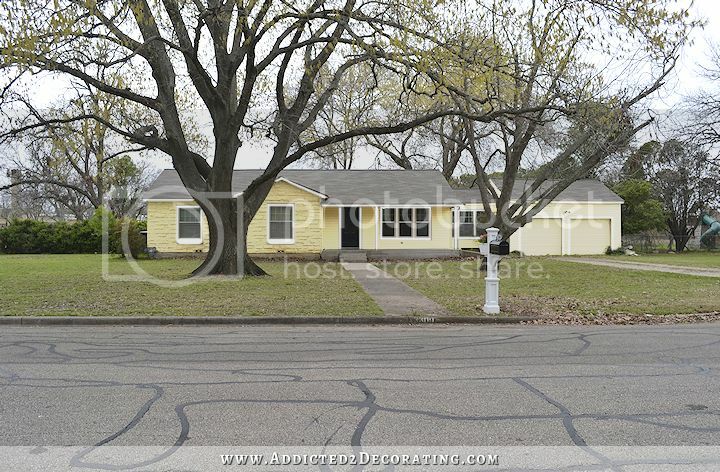 I love the mock up pic Angela did of your house painted the yellow color….it looks so refreshing and more modern. You are going to have a fun spring/summer this year Kristi and I look forward to all your progress. I agree that that majestic oak needs no other trees around. I love all the things you do to your home. I can’t wait to see the yellow. Paint fixes everything! We call it “putting lipstick on the pig”! Just pretty it up until you can make the real changes. It will look great, and I can’t wait to see how fresh it is going to look. Don’t you just get so excited using that power washer, so addictive! Power washing sure has made everything look a heckuva lot better! And thanks too, Angela, for your mockup, as it gave all of us a good idea of how the house will look. Two things about power washing I want to pass along: First, do NOT use it to wash dirty fins on an outdoor AC compressor, as they are fragile and will bend and break under that pressure. 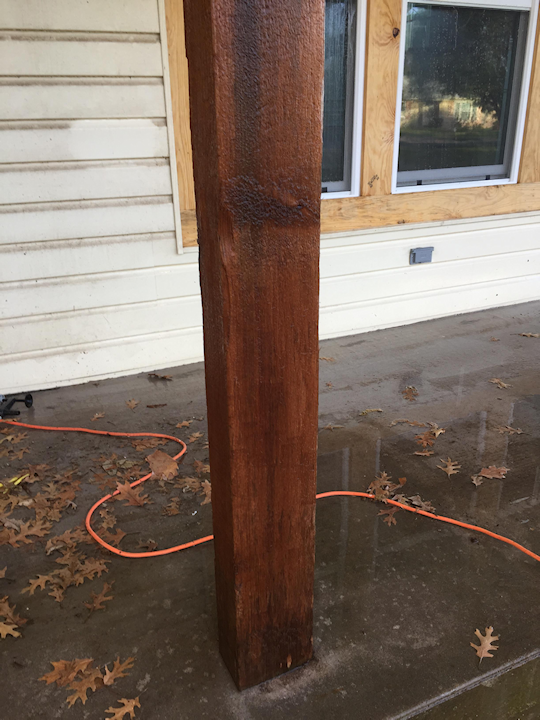 And second, as you can see from the results on the cedar post, power washing wood fences works wonders! And if you do decide to plant another tree in place of the pecan (or want any other plant advice), you can get great help from Mr. Smarty Plants http://www.wildflower.org/expert/ at the Lady Bird Johnson Wildflower Center. Our power washer is ourfavorite ty at our house. My hubs looks for exuses to use it and it doesae a wonderful job for the amount of money it didn’t cost. Lov what you are doing with your home. Keep it up! Love your work. PS do you have a blog on making curtains! OMG! Pressure cleaning or power washing is addictive, isn’t it?